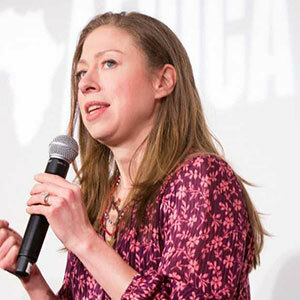 Former first daughter Chelsea Clinton called for a ban on all sales of ivory at a Tiffany & Co. Foundation–hosted panel discussion, held on April 26 at Milk Studios in New York City. She said that the United States needs to take a stronger stand on ivory trafficking. Clinton made her remarks at a screening of the new film My Africa, which was made possible in part by funding from the Tiffany & Co. Foundation. The 10-minute virtual reality film, narrated by Lupita Nyong’o, is seen through the eyes of a young villager in Kenya. A trailer for the film can be seen here. Also on the panel were Sammy Leseita Lemoonga, chief operating officer of the Reteti Elephant Sanctuary in Kenya, and Dr. M. Sanjayan, the CEO of Conservation International, which also underwrote the film.